Little Miss Muffet sat on a tuffet eating her curdys and whey. Along came a spider that sat down beside her and made her his Princess that day. Every year since my daughter was born, my dog Neo and she have dressed as a “couple.” This year’s costumes idea came into my head when I saw a joke post of a dog’s owner scared silly by the dog greeting them wearing a spider costume. I thought I can do that! 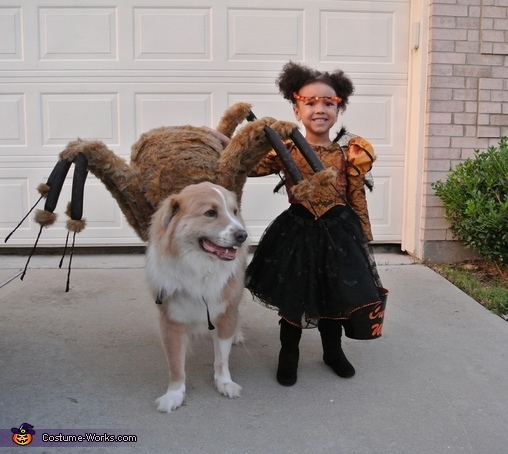 I will make my dog “the spider” and my daughter “Little Miss Muffet.” Well, my daughter was not too keen on the idea of being called “Little Miss Muffet” who ran away from the spider in fright; instead she decided to be a Spider Princess with pet spiders! To make Neo’s large spider costume, I used a doggie-camel pack that usually carries a water pouch. Felt fabric that is a close match to Neo’s coat color was attached to the doggie pack. A beach ball for the spider body was covered in the same felt. I used foam pipe covers that I painted with acrylic paint in black, brown and red for the juicy part of spider’s legs and wire hangers covered with black ribbon for the bottoms of the legs. Fuzzy animal fabric was sewn and glued to the ball and legs for more of a spidery look. Painting the legs was a bit messier than I expected, but fairly easy once I got to the third leg. The most difficult part of the costume was that it is very wide, so when walking Neo I had to make sure that we didn’t get too close to cars, walls, people, or doorways. Also, because of Neo’s super soft silky coat, the spider ball would slide to one side or the other a bit too much. I placed a rug gripper under the doggie pack to stop it from slipping. This was definitely not a costume for a dog who hates to wear them. Neo is really a good sport about it all. He seems to like the “oooos” and “ahhhs” as much as I do, but only for Halloween and Christmas. My daughter’s costume was going to be a cute “Little Miss Muffet” storybook type costume, but she didn’t like that idea. She saw this spider web, bat lace fabric I had in the sewing room that was from a previous project and asked for a tutu to be made with it. With that the Spider Princess was born. Raw silk orange remnant was used for her Royal jacket, ribbon trimmed the leg of mutton sleeves, with a spider web bat lace overlay. Her winged pet spider, aka “Spidey,” was a spider I had from my costume last year. I enhanced the spider with the same web bat lace and she wore it with clear elastic straps, the same way as store brought Angel wings. Since my daughter’s costume was so dark, I attached a battery operated pack of 9 ft. red LED ultra slim wire light set to a satin ribbon and tacked it into the skirt for some pop and night time safety. The battery pack was a bit heavy so having it on a separate ribbon helped keep it from slipping off or weigh the skirt down. No one called her “Little Miss Muffet” and guessed that she was a Spider Princess! She not only wore the costume all day as we took care of some errands, she also had a great night running from house to house trick or treating! I love creating these costume duos for my babies. I can’t wait until next year! Maybe I will do a dress up party for her birthday to bide my time until next Halloween. Spider Princess cost was $15 for the lights in the skirt and light up necklace that I used as a crown. Everything else we used to sew her costume came from left over material from other projects. The spider cost was a total of $45 for fabric and foam pipe covers. Hi Madelyn, My Mother and I made both the dog's costume and my daughter's. Which one are you interested in?